Having a good day today. The sun is shining and I gots to howl at the tornado warning sirens that go off every Wednesday at noon for a test cycle. Me and my Vizsla siblings have a grand old howling session every Wednesday. 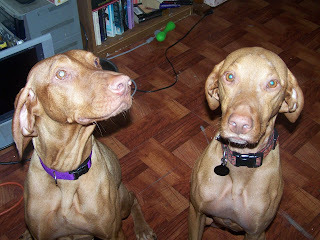 I thought I would introduce you to my Vizsla siblings today. They are Treska Louise (left) and Butler Eugene (right). They are my bestest friends. I play ball with them and wrestle with them and play lots of tug. We are a crazy bunch. We love to swim in the lake, chase birds and squirrels, and in general do fun doggy things. Treska is bird crazy! When she is outside that is all she wants to do. She watches and chases birds. Moms rescued her from Colorado. She has lived with us for two years and is very happy to have a forever home. Moms has lots of training to do with Treska, but with a little more work, Moms wants to get Treska involved in all kinds of doggie sports. Butler is my bestest hanging out on the couch buddy. Moms got him from Red Dog Ranch in Ramona, CA. He runs agility and has lots of obedience training with Moms bestest trainer friend Joella Cunnington with The Uncommon Canine in Poway, CA. Moms wants Butler to start flyball soon, but the temperature has got to gets a little bit warmer around here. Well, I think I am all done for today. Moms has errands to run cause she is off to work for 7 days at clients house in Greer's Ferry tomorrow.